For me, nothing compares to an amaryllis (Hippeastrum) at Christmas. I’ve never really been a poinsettia person. I’m sure this has nothing to do with me working for a grower in high school where we would sit on an assembly line, dipping poinsettia cuttings into rooting powder and then sticking them into peat pellets. We did this every day after school and on weekends for hours upon hours. Besides, amaryllis are perfection in my eyes. The big blooms are gorgeous. They’re easy to grow and take care of. I know more people that keep their amaryllis year to year than don’t. Try saying that about a poinsettia. Also, they grow so fast you’d swear that if you sat down, with a latté, and watched it, you’d see it growing. At the least, you’d forget about any stress while trying to catch a glimpse of it getting bigger. When selecting bulbs, remember that the size of the bulb does make a difference. A regular size bulb, measuring 24 – 26 cm around the circumference will usually give you one, maybe two bloom stalks. A large bulb measuring 34 – 36 cm will often give you three bloom stalks. A jumbo bulb, at 42 cm can produce up to six bloom stalks. While red, white, or red and white flowers are more traditional Christmas colours, more unique colours and flower shapes have become quite popular. I have a landscaper who buys amaryllis bulbs to pot up for her customers as gifts. She buys pink, orange, and lime colours f or her Jewish clients. Papilio, sometimes called the butterfly amaryllis, is a species from the Brazilian rain forests. It was only discovered in 1967 and is believed to be extinct in nature. 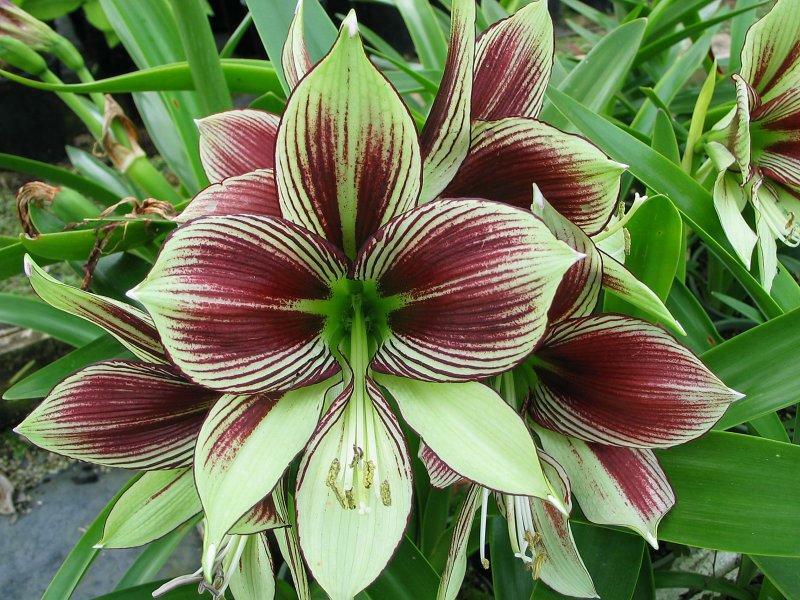 It has green-white flowers with burgundy stripes and is my best seller. So what do you do with the bulb once you’ve bought one? The pot only needs to be a small amount bigger than the bulb. I pick pots that will allow the width of my thumb between the bulb and the pot. Also, heavier pots are less likely to tip over under the weight of the flowers. You can use a soilless mix or any potting mix. Plant the bulbs so that about one third of the bulb is above the soil and pack the soil down rather firmly. Water it in well, but try not to water the bulb itself. An easy way to do this is to keep a deep saucer under your pot and fill it with water. Give your plant lots of sunlight, preferably a south or west window. Initially, water sparingly, when the soil has mostly dried out. After your amaryllis is growing actively, you have to water more often and fertilize it every once in a while. After about six – eight weeks, you’ll be rewarded with big beautiful blooms. As each bloom stalk finishes, cut it back to a few inches. You might want to do this over a sink as water usually comes out of the stalk. Once your bulb has finished flowering, keep watering it and fertilizing, allowing the leaves to develop. When it warms up in the spring, you can take it outside. Give it lots of sun and regular watering and fertilizing. It will dry out a lot quicker outside than inside. Around mid July, I stop watering altogether and move my pots to a spot where they don’t get rain. This will get the leaves to start dying off. When the leaves have completely yellowed and dried, cut them off and store the bulb somewhere cool, like a fruit cellar. I know a number of people will try the furnace room, but this isn’t usually cold enough. If you don’t have a cold place to keep the bulb, put it in a paper bag, and store it in the vegetable crisper of your fridge. The paper bag will protect the bulb from any ethylene gas. Keep the bulb in it’s cool hibernation for ten weeks. You can then replant the bulb, latté in hand, and forget about your worries. This entry was posted in Columns and tagged Amaryllis, care, Hippeastrum, Papilio. Bookmark the permalink.